starred review in Publisher’s Weekly! Big news: the manifesto got a starred review—those are rare— in this week’s Publisher’s Weekly, the industry’s trade magazine. It’s been proving very difficult to get a self-published book on the mainstream radar, so this is gratifying. 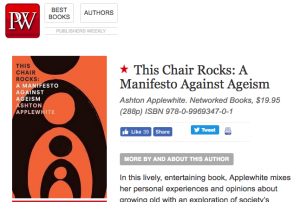 Takeaway quote: “[Applewhite’s] humor, high-energy writing, and emphasis on positive ways to view and experience age contribute to making this a valuable resource, an agent for social change, and an enjoyable read.” Self-publish together to change the world! How about an ageism-related version of the Bechdel test?